THE "APHID LION" After a few days, the eggs hatch and tiny larvae emerge which are also known as"aphid lions" because of their voracious appetite. There is no other better predator known to consume vast quantities of eggs and the soft bodies of aphids, mealy-bugs, spider mites, leafhopper nymphs, caterpillar eggs, scales, thrips, and white-flies. The lacewing larvae attack the eggs of most pests and, if the bodies are not to hard and fast moving, will attack the adult pest stage as well. Use lacewing eggs/larvae for greenhouses and gardens. 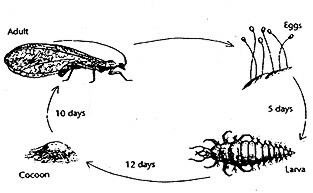 Larvae will only feed for 1-3 weeks before they become adults (eating only nectar and honeydew). Use approximately 10 lacewing eggs/larvae per plant or 1000 eggs per 200 square feet. After a few days, the eggs hatch and tiny larvae emerge. The larvae are gray-brown in color and newly hatch are very tiny. Similar in appearance to an alligator with pincers, the lacewing larvae vigorously attacks its prey, injects a paralyzing venom, and draws out the body fluids of its helpless victim. Depending on climate conditions, the adults will live for about four to six weeks, feeding only on nectar, pollen and honeydew. If these food sources are not avalable, it will simply leave the area and lay its eggs elsewhere. Green lacewing eggs are shipped in bran or rice hulls and packed with moth eggs for food. The best time to release is early morning or later afternoon. Never release in the heat of the day. For best results, immediate use is advised however, when release is inconvenient, they can be stored in the refrigerator for up to 48 hours. Warmer temperatures will speed up their emergence and newly hatched lacewing larvae are hungry and will cannibalize each other if they are not released quickly. If the infestation has not been arrested after 5 to 7 days, additional releases may be necessary. When releasing on a regular schedule, change the release sites within the target area to get maximum coverage.